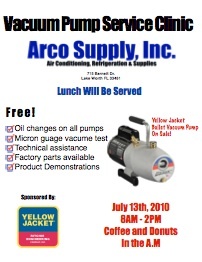 Your vacuum pump has been working hard all summer, so why not stop in and get your pump serviced for free. If you have been looking to upgrade your pump, we will be offering a counter day discount on the Bullet 7 c.f.m pump by Yellow Jacket. We will be serving breakfast and lunch throughout the day.